Mukkabaaz breakthrough star Viineet Singh has joined the cast of biographical drama, Saand Ki Aankh. 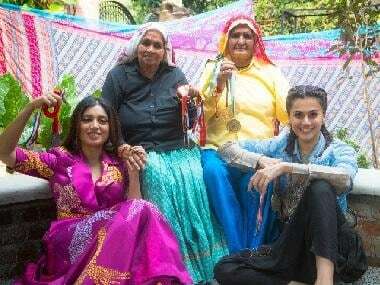 The film, which will chronicle the story of world's oldest sharpshooters Chandro and and her sister-in-law Prakashi Tomar, will feature Taapsee Pannu and Bhumi Pednekar in the lead. It will also see director Prakash Jha in a pivotal role. Originally titled Womaniya, the film was renamed Saand Ki Aankh, following a titles right dispute. The film will mark writer Tushar Hiranandani's (Dishoom, Ek Villain, ABCD 2 and Grand Masti) directorial debut. Anurag Kashyap is co-producing the film with Shibasish Sarkar and Nidhi Parmar. The film is set in the hinterlands of Uttar Pradesh and went on floors in Meerut in February. Viineet, who has featured in films such as Lalbaug Parel, Bombay Talkies, Gangs of Wasseypur and Ugly, last appeared in Akshay Kumar's sports-drama Gold. He will be next seen in spy thriller Bard of Blood, alongside Emraan Hashmi. The Netflix series is an official adaptation of Bilal Siddiqi's bestselling 2015 book of the same name.